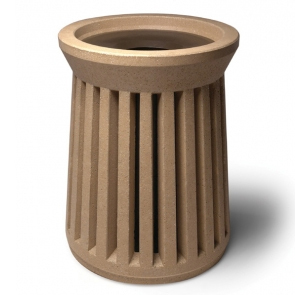 This 41 gallon concrete waste receptacle is a result of that ideal balance of form meeting function. The unique design is crafted to showcase the expansive vertical slats rising from the solid base to the architecturally flared top. The natural elements of concrete combine with your choice of finish and color ensuring this receptacle will blend into just about any environment. The aluminum funnel lid adds a great accent to the receptacle but more importantly offers hands-free pitch-in disposal all while nicely concealing the contents from public view. This architecturally styled round receptacle is constructed with steel-rebar-reinforced concrete that will provide legendary durability promoting clean safe environments.